formed as a result of observations and intuition. ‘Axiom’ is a statement, the truth of which is accepted without any proof. 3. Axioms should be minimum in numbers. 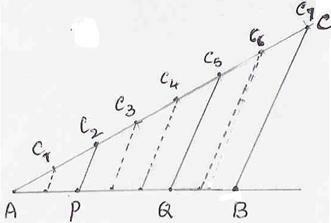 In Figure 1, length of AB=3cm and in Figure 2, length of CD=3cm, then we say that AB=CD.. In Figure 3, ABC = 500 and in Figure 4, PQR = 500, then we say that ABC = PQR. 6.2.1 Axiom 1: Things which are equal to the same thing are equal to one another. In Figure 5, AB=3cm and BE=2cm. In Figure 6, CD=3cm and DF =2cm. In Figure 7, ABC = 200 and CBD = 400. In Figure 8, PQR = 200 and RQS = 400. If CBD and RQS are added to ABC and PQR respectively then we have ABD= 600 and PQS = 600 and we say ABD = PQS. In Figure 9, AE=5cm and BE=2cm. In Figure 10, CF=5cm and DF =2cm. If BE and DF are subtracted from AE and CF respectively then we have AB=AE-BE=3cms and CD=CF-DF=3cm and we say AB=CD. In Figure 11, ABD = 600 and CBD = 400. In Figure 12, PQS = 600 and RQS = 400. If CBD and RQS are subtracted from ABD and PQS respectively then we have ABC = 200 and PQR = 200 and we say ABC = PQR. 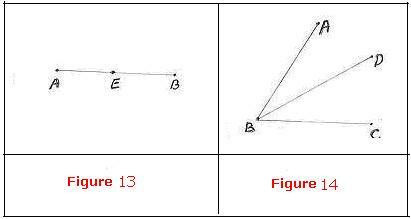 In Figure 13, compare AB with AE and EB, We say that AB>AE and AB>BE. In Figure 14, compare ABC with ABD and DBC. We say that ABC > ABD and ABC > DBC. Note: These axioms are used in any branch of Mathematics and not necessarily only in Geometry. English dictionary gives the meaning for postulate as ‘guess’ or ‘propose’ or ‘assume’. Definition: ‘Postulates’ are mathematical statements in geometry, which are assumed to be true without proof. They are like axioms but they can be cross verified by actual construction and measurements. Have you ever thought about how people mark the lanes for 100 meters running race? They identify two points which are 100 meters apart and draw the line joining these two points with chalk powder. Are they using any rule of geometry? In the adjacent figure, A and B are two points and AB is the line passing through them. 6.2.2 Postulate 1: One and only one line can be drawn passing through two points. Is it not interesting to note that without knowing this postulate, lanes/tracks are marked by workmen? Have you thought of any assumption that is made when spokes of the bicycle are joined at the center of the wheel? In the adjacent figure O is the center of the wheel and several lines (spokes) pass through it. 6.2.2 Postulate 2: Any number of lines can be drawn passing through a point. Spokes in the wheel of a bullock cart/bicycle is a best example of use of this postulate. In the adjacent figure PQ is a line which is extended on both sides. 6.2.2 Postulate 4: Angle formed at the common point of two opposite rays is 1800. In the adjacent figure the lines AB and CD cross at O or they are parallel to each other. 6.2.2 Postulate 5: Two straight lines either meet at only one point or they do not have a common point. In the adjacent figure, lines AB and CD which are parallel, will never meet even if they are extended on both sides (like railway lines). 6.2.2 Postulate 6: Two parallel lines in a plane never meet even if produced infinitely on either side. Conclusion: From postulates 5 and 6, we conclude that any two straight lines which do not have a common point are parallel to each other. Let us learn what Enunciations are. The English dictionary gives the meaning of Enunciations as ‘guess’ or ‘propose’. Enunciations are true facts which can only be verified by construction or measurements. 6.2.3 Enunciation 1: If a ray stands on a straight line, the sum of angles formed at the common point is 1800. 6.2.3 Enunciation 2: If two straight lines intersect, the vertically opposite angles are equal. and OC is standing on AB. and OA is standing on DC. Similarly we can prove AOC = DOB. The length of the transversal between parallel lines is called ‘intercept’ In Figure 4, GH is an intercept. In the adjacent figure, AB and CD are parallel lines and EF is a transversal. Then EGB = GHD, AGH = CHF, AGE = GHC and BGH = DHF. 6.2.3 Enunciation 3: If a transversal cuts two parallel lines, then the corresponding angles are equal. 6.2.3 Enunciation 4: If a transversal cuts two lines in such a way that the corresponding angles are equal then the two lines are parallel. Prove that ROQ = 900.
that QOP is a right angle. 6.2 Problem 3: In the figure, O is a point on the straight line AB. If a-b =800, find all angles. 6.2 Problem 5: In the figure, PQ and RS are straight lines. OA bisects POR and OB bisects SOQ. Prove that AB is a straight line. BC is a straight line. 6.2 Problem 7: In the figure, AGE=1200 and CHF = 600. Find out whether AB||CD or not. CHF and GHD are vertically opposite angles and it is given that CHF = 600. 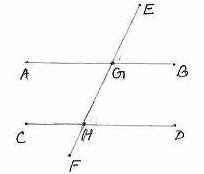 Since EGB and GHD are corresponding angles and are equal, by Enunciation 4, AB and CD are parallel. find all the angles in the figure. Since AB is a straight line, AGE + EGB =1800. Since the ratio of angles is 3:2, 1800 needs to be split in to two angles as per this ratio. Total parts = 3+2 =5. Construction: Draw a line TU parallel to PQ through O, extend SR to Y, extend QP to X, extend RO to V and extend OP to Z. 1. Two lines which are parallel to the same line are parallel to each other. 2. Two lines which are perpendicular to the same line are parallel to each other. 3. Two parallel lines make equal intercepts on all transversals perpendicular to them. any other transversal as well. 5. ‘Proportional intercepts property’: Three or more parallel lines intersecting any two transversals make intercepts on them in the same proportion. We use the ‘Proportional intercepts property’ for this construction.